Here at Cognology we love data that supports the importance of great people management. Today we’ve got some particularly interesting data from Glassdoor that all managers (and investors) should pay close attention to. We’ve dug into Glassdoor data to understand the impact of employee happiness and satisfaction on share price performance. Glassdoor is a website where employees and former employees anonymously review companies and their management. The data and reviews are then made publically available. As you can see, it’s gives a quick feel for what it’s really like to work at the company on a number of measures. But deeper than just employee happiness, Glassdoor is also a pretty good indicator of management capability. 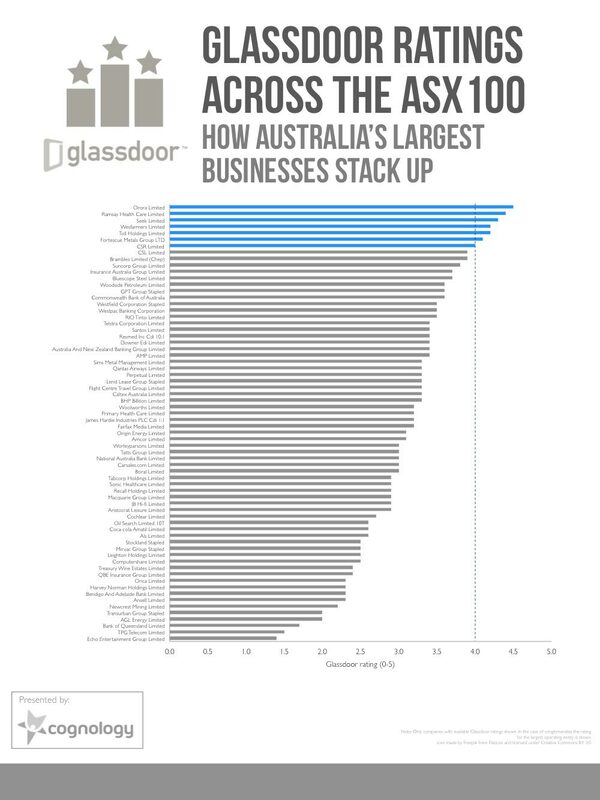 As we showed in our recent piece on Management Capability, Glassdoor ratings sit broadly in line with the Australian Institute of Management’s capability index. 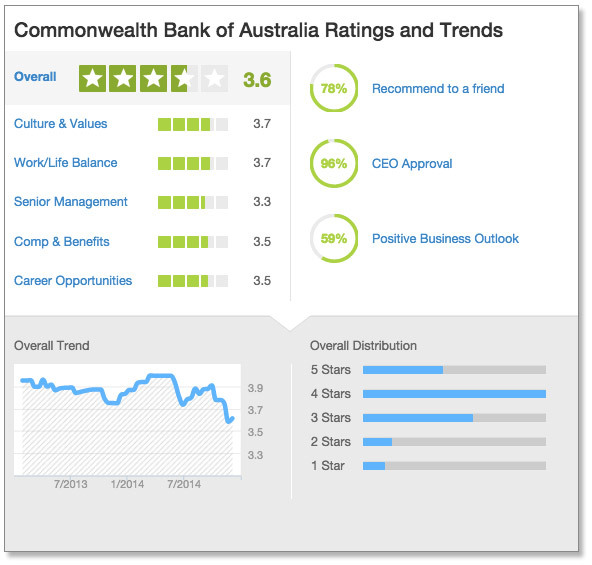 What do these ratings say about Australia’s largest companies? Note that we’re only including companies with reviews on Glassdoor (which is why there’s 68 companies listed here instead of 100). Due to size or industry, some companies don’t have enough ratings to show data. As you can see above, most companies tend to cluster somewhere between a rating of 3 and 4. What has this got to do with share price performance? One of the big questions about Glassdoor is always “does the rating really mean anything?”. Anonymous reviews sound awfully like they could be gamed by a company that wanted a quick ratings boost. Or just as easily destroyed by a particularly bitter ex-employee. So, in aggregate, do these ratings actually tell us anything meaningful about the companies listed? Perhaps the most impartial way to look at overall corporate performance is the share price. There’s a lot of nuances that share market misses – but there’s no disagreement that it’s a very clear public indicator of performance that all stakeholders care about. Whilst it’s easy to make the argument that employee engagement and management capability is causing share price outperformance, let’s not get too carried away and start the “Glassdoor ratings >4 hedge fund” (although we did very briefly consider it before publishing this article). To be very clear, I’ve always believed that there’s a relationship between great talent management and company value. But before we say this is definitive proof of the huge value of talent management, there’s more research required. Do companies that are achieving stronger share-price growth just have happier employees? It is possible that the causation works in the other direction? In any case, it’s fascinating data that requires more attention and thought. It’s safe to say you should expect more questions from investor relations about your talent management strategy in the near future. Please note: Clearly, this isn’t investment advice. And for the sake of full disclosure, nobody involved in the publication of this article holds shares in any of the outperformers referenced. 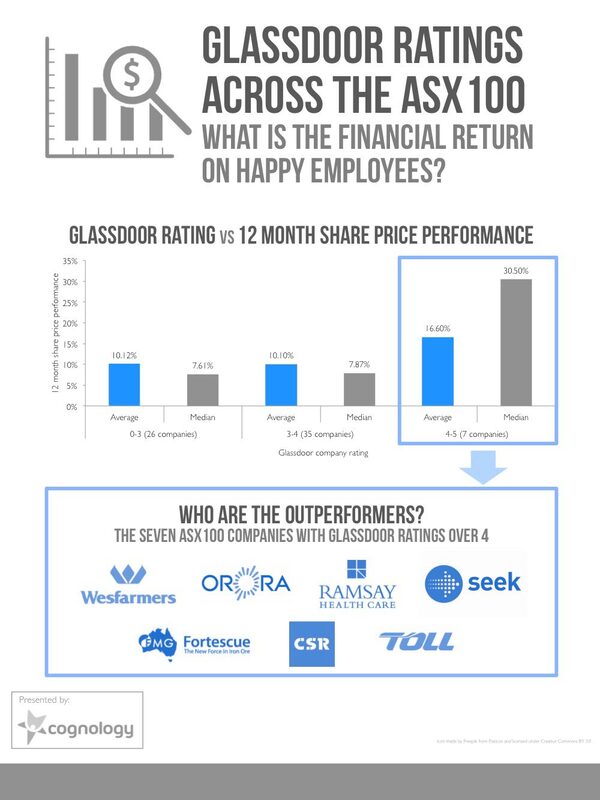 https://www.cognology.com.au/wp-content/uploads/2015/02/ASX-100-Glassdoor-ratings.gif 210 210 Jon Windust https://www.cognology.com.au/wp-content/uploads/2017/01/Cognology-logo-colour-300x101.png Jon Windust2015-02-02 02:18:332015-05-22 04:43:24Does talent management drive share price performance?